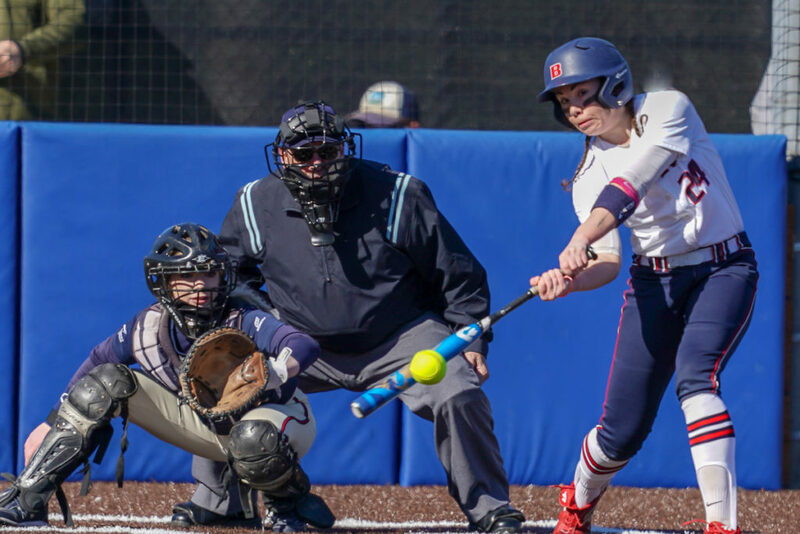 Bellevue College softball split a league doubleheader at Olympic College today winning 9-1 before dropping the nightcap on a walk-off in extra innings, 9-8. In the first game, Rhaney Harris tossed a three-hitter in the complete game win in the circle. Nashoni Boyd clubbed a home run, her second of the year, and had four RBI’s to lead Bellevue’s offense. Boyd singled in BC’s first run driving in Angel Prewitt and hit her home run, a three-run shot, in the third, putting Bellevue up 7-0. In game two, Bellevue jumped up early in the first inning, as they have done on many occasions all year long, 3-0 on a two-RBI single by Katie Noble. BC then did something out of character by letting Olympic back into the game quickly, spotting the Rangers with four runs in the first three innings. As the score remained close, with the game tied in the third, fifth, and seventh innings, OC rallied late putting up three runs in the bottom of the seventh, sending the game into extra innings. In the top of the eighth with the heart of the lineup set to come up for BC, the Bulldogs mounted a threat with a walk to Meg Marino and a single by Tatum Dow with one out. Boyd grounded into a double play to quickly end the threat as OC would then win the game after a leadoff triple to open up the bottom of the eighth. Dow went 3-for-5 to raise her NWAC-leading average to .600 while Maddy Trout went 3-for-4 with three RBI’s to pace the Bulldogs. Bellevue is now 5-1 in league (16-3 overall). Douglas College comes to town for a North Region showdown this Tuesday March 26. First pitch is set for 3:00 p.m.